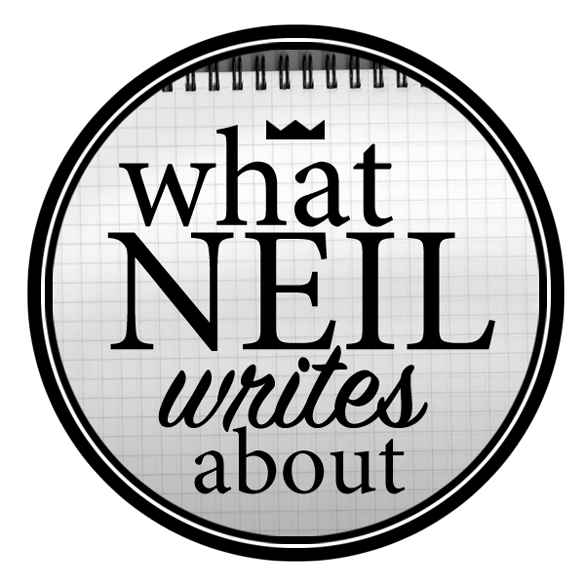 With several Projects on my plate, I decided to stream line some reviews by focusing on select best selling dishes from popular restaurants. This is the Quick Dish Review. For our first ever Quick Dish, we try the two of the more exotic best sellers from Ramen Yushoken who pride themselves for their Shoyu Ramen. Look at those thick noodles and thick pork chashu! 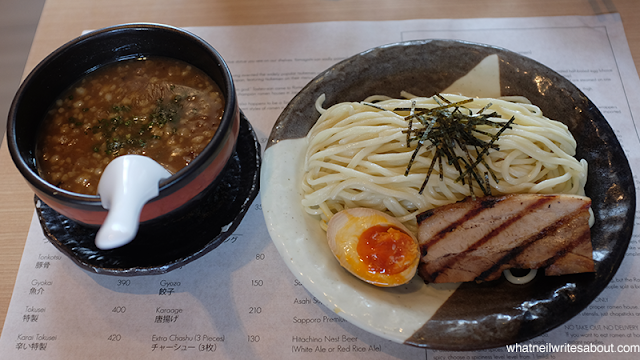 Tsukemen is another form of ramen where the noodles and the soup base is separate. To eat it you must dip the noodles on the soup bowl. Ramen Yushoken's Tokusei is made of miso based broth with a secret ingredient, Mackerel! The Mackerel on this soup is absolutely pronounced and it adds another layer of depth to the rich miso ramen base of Ramen Yushoken. It is a treat when you dip the thick noodles into the soup, and then slurp it all up! 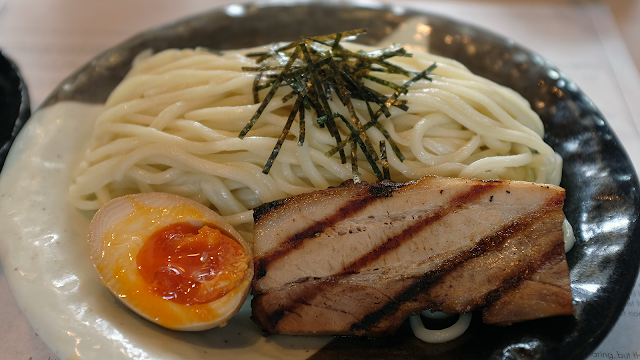 The flavors of umami, salt, meat and noodles danced in my mouth endlessly. So much so that I finished the dish in five minutes! You must try it if you do not mind fish based broth! Look at that Sesame Oil and Chili Oil! 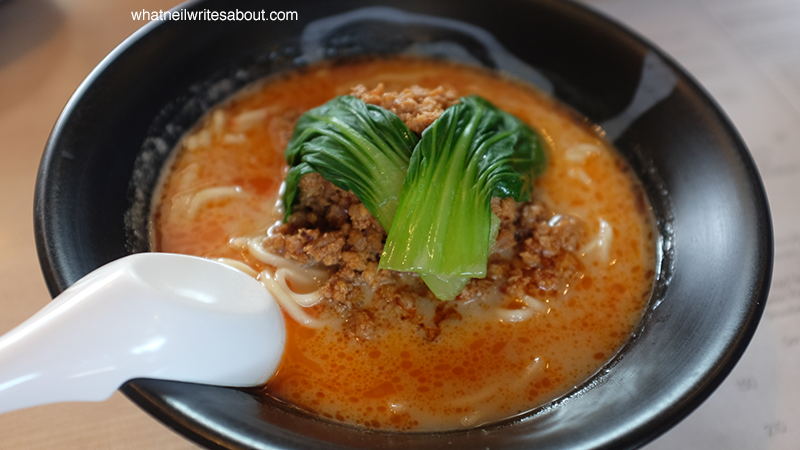 Tantanmen is inspired by the dandan noodles from Szechuan, China. It is made with mince pork, sesame oil, and chili oil. Broth on it's own is strong. It isn't tongue numbing spicy, but it is enough to get you sweating but in a refreshing way. The noodles serve to counter some of the strong flavors of the broth. When coupled with the minced meat and vegetables it forms a complete taste in your mouth. I love it. If you love spicy ramen, you must have this! Crispy outer shell with moist and tender insides! 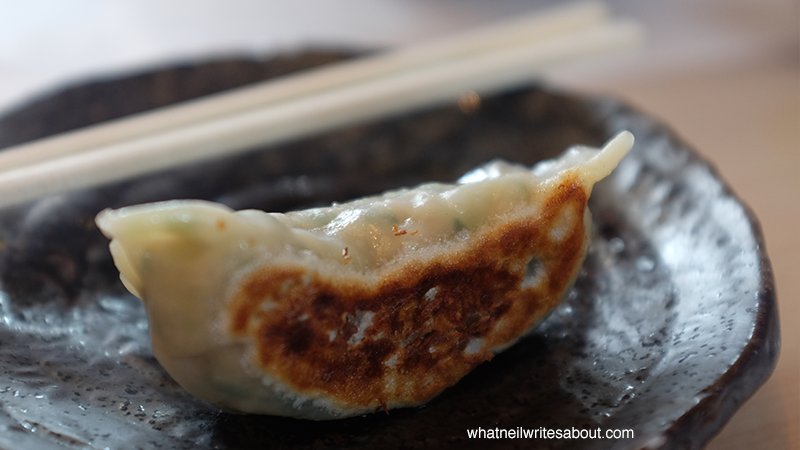 Gyoza is a dish that can stand on its own and Ramen Yushoken is one of the better ones that you can find in the metro. The outer shell is flavorful and crispy while the inside is moist and tender that you can probably finish five of these in one sitting. We had the Gyoza as a side dish and it served to kind of cleanse our palete from the strong Ramen Broths. Although, mixing the gyoza and the broth is not a bad thing. I kind of like it.